Arming recruiters and reserve centers is almost as stupid as disarming them | Dude, Where's My Freedom? Posted on July 23, 2015	by Dude Where's My Freedom? Full Disclosure: I have a dog in this fight. I worked at a reserve center that was essentially a public building with almost zero security for about four years. To a certain extent, I was actually in charge of our “security.” Because we were such a small command, this was a “collateral duty” meaning it was an extra thing I had to do in addition to my regular job, meaning it was paid very little attention – it was considered a minor annoyance that distracted me from what I was really there for. My suspicion is that for the overwhelming majority of recruiting stations and reserve centers, security is managed as a collateral duty in this respect. In the aftermath of the shootings in Chattanooga, we’re seeing increased calls for the “arming” of recruiting stations and reserve centers. As usual, this is presented in the standard American “right versus left” debate format. Conservatives think military personnel at these locations should be “armed,” liberals, presumably, don’t. But, yet again, there’s a superior third option – that is going completely and totally ignored. The appropriate response to a heavy-handed, one-size-fits-all regulation (such as, “no weapons allowed in federal buildings”) is not another heavy-handed, one-size-fits-all regulation (such as, “everyone in military stations must carry weapons.”) Speaking as someone who used to work at such a place, I wouldn’t want to be issued and have to carry a gun all the time for my routine desk job. It would really just be one extra hassle I’d have to go through. One more piece of training and qualification I’d have to get on a yearly basis. One more thing to remember to bring with me every morning. It would be a distraction and an annoyance and wouldn’t really help me do my job at all. As I mentioned above, this is being framed as an all or nothing sort of binary proposition. Either recruiters are armed, or they’re not. But there’s absolutely no reason why that must be the case. There’s a perfectly viable (in fact, probably superior) alternative – the option that never occurs to anyone who operates under a statist mindset – the libertarian and voluntarist option: carry a gun if you want, or don’t carry one if you don’t want to. The proper response to this scenario is not to pass some new additional law or responsibility or requirement – it is simply to eliminate the last one that was passed forbidding military personnel from carrying weapons in these places. Simply discard that, and place military personnel at these sites under the same laws and regulations that civilians in public places have to abide by. Those who want to obtain a concealed carry permit and carry a weapon can do so, and those who don’t want to, can choose not to. There is literally no flaw to this plan – other than that it diminishes government control and micromanagement over the military. It would achieve the desired objective of increasing the security of these installations. As John Lott discusses in his book, “More Guns, Less Crime” concealed carry creates a deterrence effect. Criminals (even violent and suicidal mass shooters) are less likely to target those who they believe may be armed. It would seem to me that the military is probably over-representative of people who would choose to carry a concealed weapon, if given the opportunity. It seems statistically likely that each command would have a few people who would choose to do so, and as Lott discusses in his book, the deterrence effect doesn’t just work for those who choose to carry – it works for everyone around them as well. Concealed carry can potentially be a better deterrent than armed guards. Posting an armed guard at the entrance of a facility where everyone else inside is disarmed is basically like having a guy standing around wearing a large sign that says “Shoot me first!” They become sitting ducks, easy targets, and provide a false sense of security to everyone else. The benefit of concealed carry is that you never know who it is that might fight back against you. This element of surprise can become a major tactical advantage. This would create no additional burden on any military personnel. The option to concealed carry would be completely voluntary, and would be selected by people who would choose to go through the necessary training and purchasing of weapons on their own anyway. It would not distract anyone from their primary duties or impose any additional training or administrative burden of any kind. You would not have to re-write or modify existing laws, rules of engagement, etc. This currently seems to be one of the primary objections to “arming” these locations. The top military generals insist that because these sites are located in civilian areas, laws and rules of engagement would have to be re-written. The article from CNN I link to above even has wonderful lines such as “the law does not permit the military to shoot civilians in the United States.” But under my plan, none of this would be necessary. Rules of engagement would not apply, because a potential active shooter scenario would not be considered a military engagement. The military members who may choose to respond to such a scenario would be acting with the same rights and responsibilities to protect themselves and others as any ordinary civilian with a concealed weapon would. This would not put the public in any additional danger. 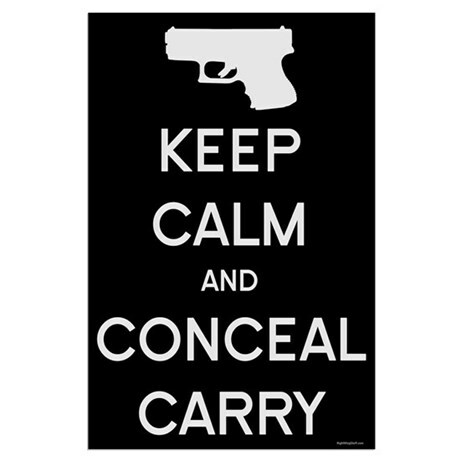 Concealed carry holders, as a group, are some of the most law abiding members of society. They are also typically gun enthusiasts who are very proficient in the operation of the weapon of their choice. In basic training for the Navy, do you know how many times I fired a live weapon? Once. Your average civilian concealed carry holder is exceptionally more qualified to handle a weapon than I was. It would enhance community relations. The sight of armed soldiers walking around shopping malls (where many recruitment centers are located) is not a particularly pleasant one to imagine. Armed guards standing outside the door could potentially deter many from walking in and engaging with the staff. The vast majority of these sites are located in towns with virtually no military presence aside from these places, and community outreach is a big deal. Under my plan, the local military recruiter would look just like everyone else at the mall, but would still be able to protect himself if necessary. It would improve the attitudes of military personnel. I’ve written before about how military culture can foster a sense of entitlement – as those in the military are indoctrinated into believing that they are somehow superior in every way to the common plebeians they protect. Giving them special rules and exemptions from local law would only reinforce this belief. It would provide an extra incentive for someone who just wants to carry a gun around to join the military – which are the exact sort of people who shouldn’t be joining the military in the first place. In every possible situation we should look to try and place the military under the exact same rules and restrictions as the civilian population they supposedly protect. This will promote increased understanding and empathy across two very different and disparate groups. It would encourage military personnel to advocate for more liberal gun laws. By requiring them to abide by the same rules as everyone else, military personnel wanting to defend themselves would be encouraged to join the advocacy for greater liberalization of concealed carry in their particular state. Gun-grabbing state and local governments would face increased public scrutiny, as they would be seen not just as disarming the general public, but disarming the military as well. Giving the military special exemptions would eliminate any incentive they might have to care about these issues, as an “I got mine, who cares about the public?” attitude would sink in. But despite all of these advantages, I hear nobody advocating this laissez-faire approach. We’re so programmed to automatically assume a top-down government enforcement method of one party or the other is the only acceptable solution to any possible problem. And once again, this is completely and totally wrong. The solution here is not to “arm” the troops, nor is it to “disarm” them. It’s to simply treat them the same way that everyone else is treated – which will naturally lead to a situation where some of them are armed and some of them aren’t, according to their own voluntary preferences. This entry was posted in News Commentary and tagged concealed carry, gun control, gun laws, gun rights, Military, recruiters, reserve centers. Bookmark the permalink. Permitted CCW is a great idea. A permit holder should be able to carry pretty much everywhere they have a legal right to be, including Recruiters at a center.